Confident entrepreneur choose drink in paper cup to go while communicate mobile. 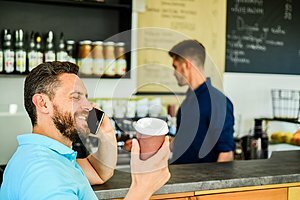 Man speak mobile phone and drink coffee cafe bar background. Man solving problems phone have coffee. Happy to hear you.